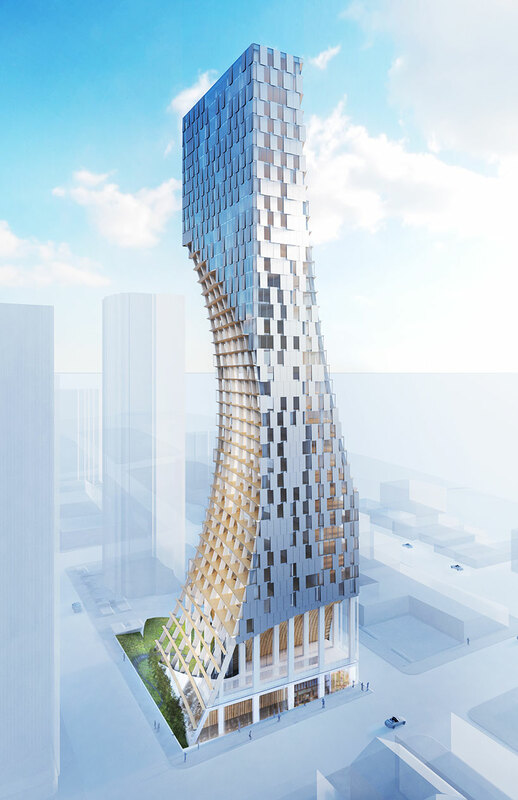 designboom recently had the chance to talk with famed japanese architect kengo kuma about his first residential tower project in north america located in a transitioning urban context in downtown vancouver. ‘alberni’ is a project commissioned by the canadian firm westbank corporation, an avant garde developer whose scope of work transcends that of the traditional developer through its holistic integration of the senses, merging the worlds of construction, urban design, art, culture, and philanthropy that results in structures that are meant to fit within the greater context of the community in all aspects. given kuma’s sensibilities with light and material as well as his acute sense of designing with nature, he was an obvious choice to design the new 43-story building in a city so closely tied with the surrounding landscape and asian heritage. alberni is primarily a residential tower with commercial spaces on the ground floor. the unique form features concave voids that carve away at an otherwise rectangular volume, with an exposed structure thatemphasizes the sinuous facade complemented by a tessellated three-dimensional wooden trellis. in keeping with westbank’s cultural principles, the project employs a new strategy to integrate into the urban fabric- a large part of the ground floor is public space taking the form of a japanese moss garden, the first of its kind in the city. a sculpted topography forms a natural amphitheater with walkways that cut across the site that depart from the traditional grid and offer the community a new experience when moving around the city. the moss garden offers ground-level green space capable of hosting events or simply offering a momentary pause from the concrete and glass, whose centerpiece is a westbank signature: a custom made, kuma-designed fazioli piano that adds the element of music to the astounding architectural enclosure.